We know that keeping your Yacht carpet and upholstery is no easy task with all the traffic, humidity that can cause stains on the carpet and accidents from drink spills or food spills. We have the equipment to performed a detail cleaning of your carpet and upholstery to maintain its beauty and keep your Yacht looking its best from the inside. We provide professional upholstery and mattress cleaning for Yacht interiors, our deep upholstery cleaning process can bring your Yacht upholstery back to life. Our cleaning process removes dust accumulated, spots, fabric oxidation and refreshes your upholstery. Call us today to schedule your appointment or request a free estimate by filling out our contact form. 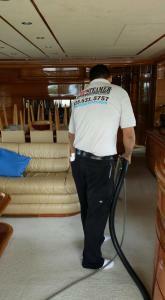 We also provide rug cleaning service for Yacht interiors, if your area rugs need cleaning call us today. Areas that we provide our Yacht carpet and upholstery cleaning services includes Miami, Aventura, Miami Beach, Coconut Grove, Ft lauderdale, Hollywood Fl, Hallandale Beach Fl. Call us to see if we service your area in Miami Dade. I wish I took before and after pictures, the 15 year old ivory carpets on our boat look brand new!! Very impressed with their quality of service, fair prices, and punctuality! Will definitely use Top Steamer again!